Heat transfer is the transfer of thermal energy from one object to another. It occurs between two objects when they are at different temperatures – the heat will transfer from hot object to cold object. In our environment heat transfer occurs all the time. The sun is transferring some of its heat energy towards earth, and we get days hotter than nights. We cook our food on stoves – it is possible due to heat transfer. There are 3 methods of heat transfer, which are conduction, convection, and radiation. Let’s discuss each of them individually. 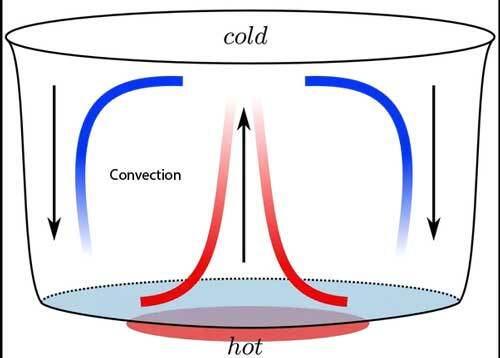 When two objects with different temperatures come in contact with each other, the heat is transferred from the hot object towards the cold object. This happens due to the collision of the molecules at the contact area of two objects. In solids, molecules of hot objects vibrate more frequently than cold objects. When hot and cold objects come in contact with each other, their molecules collide. As a result, the collisions of molecules transfer the energy from the hot object to cold object. This transfer of thermal energy continues until hot and cold objects reach the same temperature. For example, when you boil water on a gas stove, the heat is conducted to the pot from fire. Convection is the heat transfer method that only occurs in fluids (liquid and gases). It is caused by the flow and diffusion of fluids. This flow happens in the closed path – from hot regions of fluids towards cold regions and back again. For example, when water is boiled on the gas stove, the heat is conducted by metal pot. The temperature of metal pot increase, which increases the temperature of the water that is in contact with it. Hot water rises to the surface and is replaced by cold water. This process continues and causes circular motion. As a result, the heat is distributed towards all the regions of water. In this process, heat is transferred by electromagnetic waves – also known as light. This process doesn’t depend on any medium or material to transfer the heat. Instead, the radiations travel through space or air to transfer the heat. The heat is transferred to objects that absorb the radiation. As a result, their temperature increases. 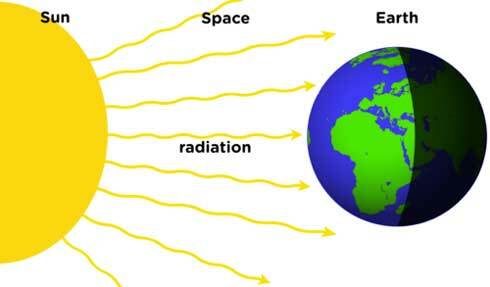 For example, the Sun transfer the heat energy as radiations that heats-up our Earth. Furthermore, the reflecting objects like mirrors can’t completely absorb the radiations. So, their temperature doesn’t increase. Insulators don’t conduct the heat very well. So, they are used to cover the objects whose heat we want to preserve. For example, when ice-creams are taken on a ride, they are stored in a styrofoam box to prevent the heat by conduction. 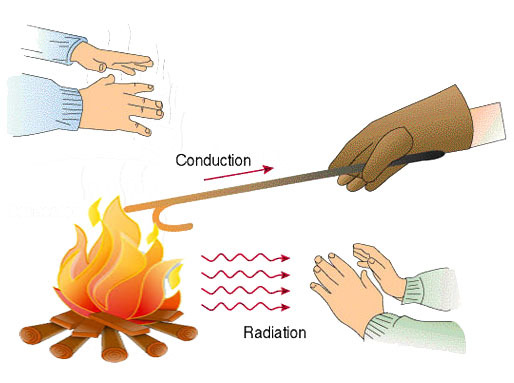 Materials that are good conductors of electricity are also good conductors of heat. 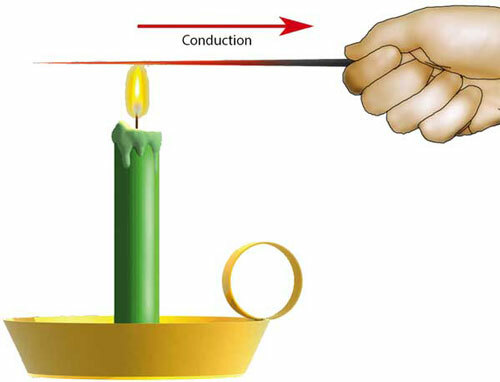 For example, copper is the best conductor of electricity, so it is also the best conductors of heat. Copper heat sinks are used on computer processors to remove the excess heat quickly by conduction. Sometimes it is necessary to transfer the heat from cold object to hot object – opposite to the natural heat transfer. This kind of heat transfer is called forced heat transfer. Today, we use forced heat transfer in air-conditioners and refrigerators to cool-down things. Abdul Wahab, "Heat Transfer," in Science4Fun, April 13, 2019, http://science4fun.info/heat-transfer/.